Doc Hellbroth‘s bodyguard. Lasted 1 round less than the Doc. Hit: 19 (3d8 + 6) bludgeoning damage and the target is grappled (Escape DC 17). Grappled targets immediately take an additional 22 (2d10+12) points of slashing damage as razor-sharp gears and blades emerge from its body to grind and slice its foe. Grappled targets automatically take this secondary damage at the start of its turn. Wall of Gears. 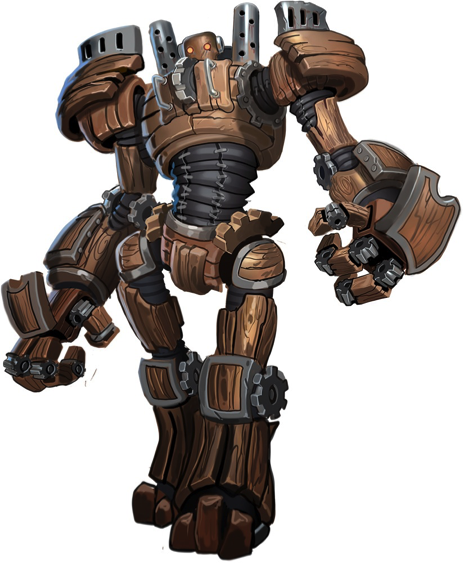 A clockwork golem can fold into a whirling wall of grinding gears measuring 10 feet by 10 feet or 5 feet by 20 feet. Anyone passing through the wall takes 45 (15d6) points of slashing damage. If the wall appears in a creature’s space, that creature can attempt a DC 17 Dexterity save to leap to one side and avoid the damage entirely. The clockwork golem can take no actions while in this form except to resume its normal form as a move action. A clockwork golem’s AC and immunities remain the same while it is in this form. Death Burst. When a clockwork golem is reduced to 0 or fewer hit points, it explodes in a shower of razor-sharp gears and debris. All creatures within a 10-foot sphere take 36 (12d6) points of slashing damage—a DC 17 Dexterity save results in half damage. A vaguely humanoid shape made of metal lurches to life with the grinding whir and frantic ticking of hundreds of gears. Another great monster. How common is adamantine for your game? Thank you! Not at all but they all have magic weapons now so damage resistance is almost irrelevant. Condition immunities and magic resistance is now way more important for mobs at this level of play – which is level 14. I am also using damage threshold consistently now for the robots as well which helps mob survivability significantly. Interesting. I am learning so much.